CryptoHIT intends to create a transparent and entirely decentralized platform for various gaming projects using the power of blockchain technology and smart contracts on Ethereum. Our mission is to create an easy-to-use, effective and financially profitable ecosystem for gamers and game developers. Predominantly, CryptoHIT platform will support decentralized games based on Ethereum blockchain, which are already under development – while many game studios that have nothing to do with blockchain are trying to integrate their own gaming platforms to a decentralized platform. In addition, CryptoHIT develops financial games with special game mechanics, which allows players to earn real money and not only play for fun and pleasure. This means that each participant of the project can start receiving their return on investment in our games before CryptoHIT decentralized platform launches. 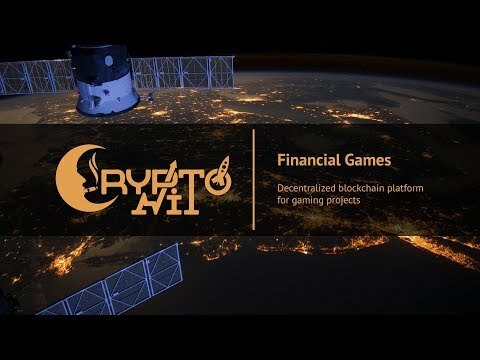 CryptoHIT is a decentralized financia lgaming platform, the priority direction of which will be integrating new generation games created based on blockchain technology. The platform will feature games of all genres and magnitude, including AAA-class games. The platform will be presented with the following versions: Web, Desktop(Windows/MacOS/Linux), Mobileapps(iOS/Android). The priority mechanism of mutual settlements on the platform will be Galactic Credit Coins(GAC) tokens created based on the Ethereum blockchain ERC-20 standard. Exchange of virtual goods enables players to trade their gaming achievements and resources for GAC tokens or purchase start packages and other game items in another game. Possibility of exchanging GAC cryptocurrency to Ethereum and vice versa by means of the platform. Amulti-level referral program, through which each participant will receive constant income from each payment of the attracted player or developer. Transparent arbitration system for players and developers with the blockchain technology. Easy integration of external game projects into the platform with API and SDK for developers. MVP does not play a role as MVP. Of the 50,000,000 tokens (or 28,500,000 tokens?) That is the maximum number of sheets to be issued, all unsold tokens are incinerated. So where do game players and developers first get tokens from? Designed assuming that all investors are gamers? How is the token's liquidity secured within the platform? How much number of players and users did you consider the number of tokens issued (the number of pieces sold)? I doubt the continued success of the project. Analysis of cryptocurrency gaming industry requirements in terms of current existing blockchain-powered solutions; Overall concept of the project is developed. Overall analysis of manpower resources and budget requirements is assessed. Development of Galaxy Credits (GAC) Ethereum-based cryptocurrency is completed; Website is created alongside member's investment area on our site to ensure Token Sale is conducted effectively; White Paper is created along with presentations and other relevant project documentation. Arrangements to list Galactic Credits (GAC) tokens on major crypto exchanges; Separate website development for Gold Miners game to enable users to effectively interact with the game's smart-contracts. Start of SmartWar game development and preparation of design and content; Development of separate website for SmartWar game to ensure smooth user interaction with the game's smart-contracts; Finish Token Sale. Galactic Credits (GAC) listing on all major cryptocurrency exchanges as soon as our ICO is completed; Deployment of SmartWar game; Open testing on Rinkeby network and subsequent launch on Main Ethereum Network. Beta-versions of decentralized platform for gaming projects; Deployment of GoldMiners & SmartWar games on our platform. Creation of API for integration of external gaming projects; Connecting at least two (2) new enterprise-grade gaming projects from premier partners to our decentralized platform. Development and launch of all-new in-house games; Active advertisement and marketing of launched gaming projects. B2B relationship engagement with third-party game developers; Implementation of multi-tier referral programs for platform users; Elaboration of incentive programs; Dynamic growth of new partner projects that are incorporated in our decentralized platform; Massive socialization and further functionality; New updates for earlier development games, as well as creation of new gaming projects.